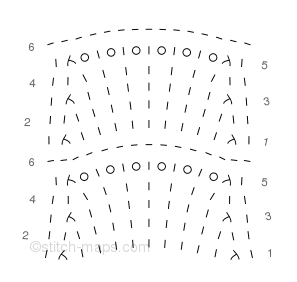 What’s with all the stitch patterns with names ending in “(copy)”? They’re the result of the “Duplicate” feature meeting with itchy trigger fingers. On each stitch pattern’s detail page, anyone who has registered a free account will see a “Duplicate” link. Clicking this link creates a copy of the stitch pattern, and lets you edit the copy. The idea is to make it easy to create variations of a stitch pattern. Unfortunately, it seems that this ease-of-duplication has spawned quite a few needless copies. I’m currently contemplating ways of keeping these silly copies to a minimum. In the meantime, if you’ve accidentally created an identical copy of a stitch pattern, would you mind deleting it please? (You can do so via the “Delete” link on the pattern’s detail page.) Thanks much! Why isn’t my doily round? Pine Cone Doily is an excellent example. Why isn’t its stitch map round? Because that’s not how the site works, unfortunately. Stitch-Maps.com doesn’t aim to display actual fabric. 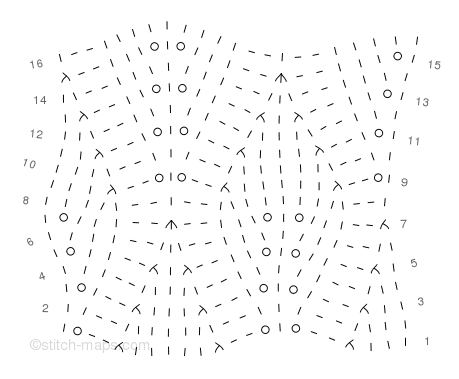 Rather, it aims to display grid-free charts, graphical representations of stitch pattern instructions. 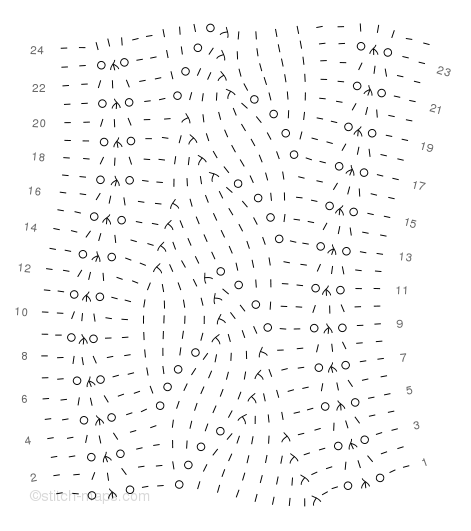 Just as with traditional grid-based charts, for instructions worked in the round our stitch maps show the beginning of rounds at the right edge of the chart, and the end of rounds at the left edge of the chart. It doesn’t connect the beginning of rounds to the end of rounds. Why won’t the site let me choose the number of horizontal repeats to display? Stitch-Maps.com will disable the “Horizontal repeats” control on a stitch pattern’s detail page if the stitch pattern’s instructions fail to have a “widen/narrow here” section on each row. That “widen/narrow here” section can take the form of *do this, do that, repeat from *, or knit, or purl. For more info on this topic, see the “Repeats” section of the knitspeak guide. Why do I keep getting error messages when I try to enter a stitch pattern? Good question! You can probably find the answer in the knitspeak guide, the new “On knitspeak” section of the FAQ, or the new “Tips and tricks” page.